Quite the end to this week here on Rewards Canada! The big news of course are the changes to the Air Canada Altitude Elite Status program. Read all about them in our separate blog post here. On the bonus offer front, the best deal of the day comes from our own Air Miles program and Hilton HHonors. Double Miles and Fast Track to Gold Status. Read more here. 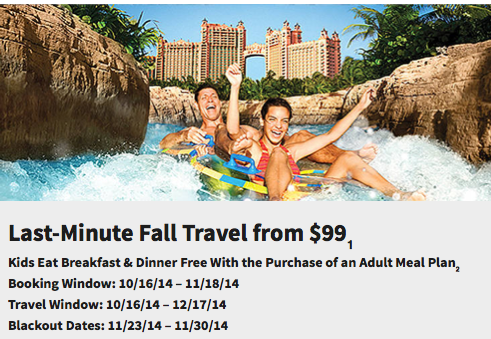 Atlantis, Paradise Island is available for as low as $99 per night if you book by Nov 18 for stays until Dec 17. And you can earn Marriott Rewards points for your stay! Book online here. - Earn up to 8,500 Bonus Aeroplan Miles when you buy an Air Canada Maple Leaf Club membership. More... Until ? - Double iPrefer Points when you book the Preferred Bed & Breakfast rate at participating Preferred Hotel locations Worldwide. More... Until ? Decent way of presenting the blog. I like it!